Have you been in a motorbike accident? Rogers Motorcycle Solicitors specialise in motorbike & bicycle law. Bikers and cyclists are among the most vulnerable users of the road. If you have been involved in an accident in the last two years, call Rogers Solicitors today. We can usually tell within one hour whether or not you have a case. Motorcyclists are a vulnerable group of road users and as such are involved in a higher number of accidents than motorists. If you are a motorcyclist and have been involved in an accident please get in contact with us today. As investment continues to be poured into resources for cyclists, (tax schemes, cycle lanes etc.) the number of cyclists on Irish roads continues to increase. However, so too does the number of accidents, if you’ve been involved in an accident please get in contact with us today. Rogers Solicitors understands the stress a road user is put under after a traffic collision and we understand how confusing it initially appears to receive legal redress for incurred injuries. We make the process as simple as possible and we invite you to get in touch today. If you’ve been involved in an accident that wasn’t your fault we invite you to get in contact with Rogers Solicitors today. We aim to make the process of receiving legal redress for your injuries as simple and as straight forward as possible. We specialise in bike accident claims, 100% of our cases are in relation to bicycle and motorbike claims. We are proud to be Ireland's first motorbike and bicycle solicitors. You are safe in the knowledge that your claim will be handled by an experienced team. Our clients are our priority. We put you first, giving you access to an experienced and dedicator team of solicitors. Email or Call us and we will organize for one of our solicitors to call you back. In all personal injury claims*, time is of the essence. We deal with bike accidents that have occurred within the past two years. Call our office or request a call back to get your claim started. Are you a motorcyclist that has been injured in a road traffic accident? Then please feel free to get in contact with Rogers Solicitors to discuss your options. My name is Ciaran Rogers, Solicitor, biker and owner of Rogers Solicitors, Ireland. I am a specialist Personal Injury Solicitor and I represent bikers who have been injured through no fault of their own across Ireland. I am a keen motorcyclist and have been riding bikes for most of my life. I got my first bike when I was ten years old and have been hooked ever since. 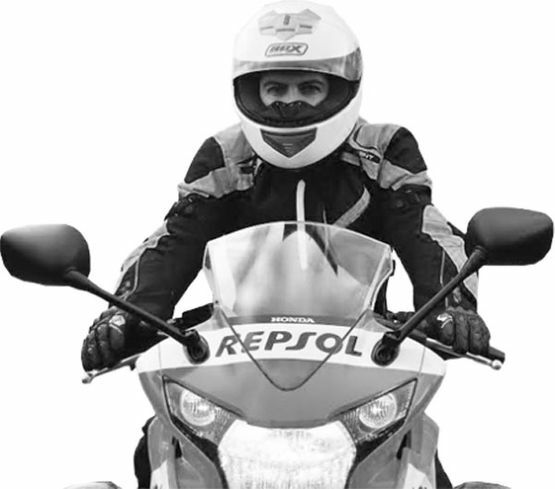 After specialising solely in Personal Injury law for almost 10 years, I set up Rogers Solicitors with the specific goal of serving the motorcycle community in Ireland. We are fast building a reputation across Ireland for aggressively pursuing, and winning, motorcycle accident cases. Clients warm to us because we are straight talking and we are well versed in motorcycle law. We do not practice in any other area of law. If you have had an accident on two wheels then please get in touch with my firm using the contact forms on screen and let us take care of the rest. We cover all of Ireland and will travel nationwide to meet you face to face.